It's not long before your learners will be running out school for the final time this academic year. So, what better time to mix up your lessons and add a bit of fun to proceedings? With this selection of fitness-focused board games and team competitions, we’re here to make sure your classes remain active despite the promise of lazy summer days on the horizon. Celebrate the end of term with this multiple-choice quiz, which encourages a little healthy competition as pupils group together to recap key topics from throughout the year. Once completed, get them running, jumping and leaping with this fitness bingo activity. Few things get learners more excited than a board game, so why not take inspiration from some old classics? 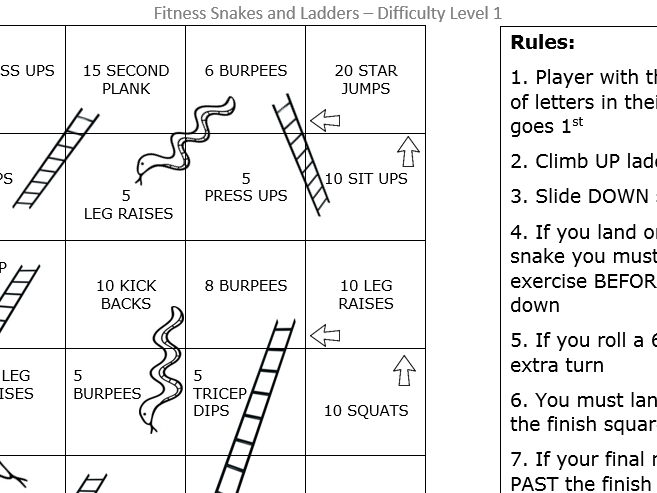 This differentiated snakes and ladders game provides an engaging way for students to participate in fitness lessons, while this easily adaptable Cluedo task helps them to their nuture communication skills as they race to the truth in order to exercise justice. The BIG fat Quiz of PE! This is a multiple choice quiz including questions involved in topics 1.1.1, 1.1.2, and 1.1.3. Along with this powerpoint, students should have an A4 whiteboard, pen and sponge so they can each write down their answer and show the teacher who can record correct/incorrect answers. Prize can be given at the end - we chose fruit! Set students into small groups or in pairs, on a station each. Give each group a different bingo table. Call out an exercise, whole class completes exercise for set amount of time then crosses off exercise on their table before rotating to next mat. I progress the lesson by asking students to write the fitness components under each exercise. This game was devised around the original Cluedo game and can be used for Outdoor Education Games - communication / team building / problem solving etc. In teams - with cards placed face down (remove 3 cards from the set - murderer / item used / and where) at other end of the hall students have to run 1 at a time to turn a card over remember it and turn it back over before running back to rest of the team letting them know what it was and they will tick it off the main card. To make it harder I have used a circuit but you can use anything (maybe blindfolded and directed by a team member through a maze or something). Students should be able to identify the murdurer / where it happened and what was used if they have done it correctly. Give the traditional game of rounders a more competitive edge by rewarding individual play with this alternative lesson structure. Or, in direct contrast, encourage group spirit as part of this team athletics competition. A game that can be adapted for whatever the rounders focus to suit the lesson in question. Similar to dutch cricket but a rounders version. A sheet I have used for athletics to encourage pupils to participate by making it a team competition. Particularly useful with groups who really don't care if they walk the 100m as their team mates encourage them and they dont want to let them down. ....13 different games. Students love dodge ball. Used as a wet weather lesson with limited space. Pupils divide their tutor groups in two and design their own game with rules, equipment etc....they could also combine games they have played before dodgeball/fball. My year 7 and 8's loved this....they showed each other their games and then choose their favourite.